NOTE: This is an advanced feature and it is not enabled by default. To Enable this feature go to the Settings Page on your home and make sure the Check Box for Enable API-Configuration Section in Gambits is Checked On. We are assuming that you have already created a ConvBot and created at least one Gambit in it. If you haven’t, then check out the getting started guide and come back here. You can check out what a Gambit means on the same article. Set any header fields that you want to put in the Request. This is useful if you want to pass some API Key or Authorization token or set custom content-type etc..
x-www-form-urlencoded (default), which will be a list of key value pairs that you can add in the input fields right below it. raw, which can be JSON, XML or text and you can select this from the drop-down menu next to it. You can put the corresponding data in the textarea below it. You can now save your gambit by clicking on the Green SAVE button on top. You must be asking. That’s all good, but how do I refer to this data that I have gotten from the API call and more importantly, how do I use the data given by the user somewhere else. This is very simple. You can display all this data anywhere – in the message bubbles, in the options buttons etc. by referring to Gambit’s varid, between double braces. e.g. in the message bubble text. Put these anywhere – in the message bubbles, in the button options, even in the API Config of some later Gambit. Just use the standard JSON notation i.e. DOT (.) for Object property and Square Brackets (, ,  etc..) for array element to refer to data in the JSON. Tip: Avoid putting any spaces in gambit varids. So use gambit_search_query, instead of gambit search query. As you already know, a Gambit means one single messaging back and forth between the bot and user. 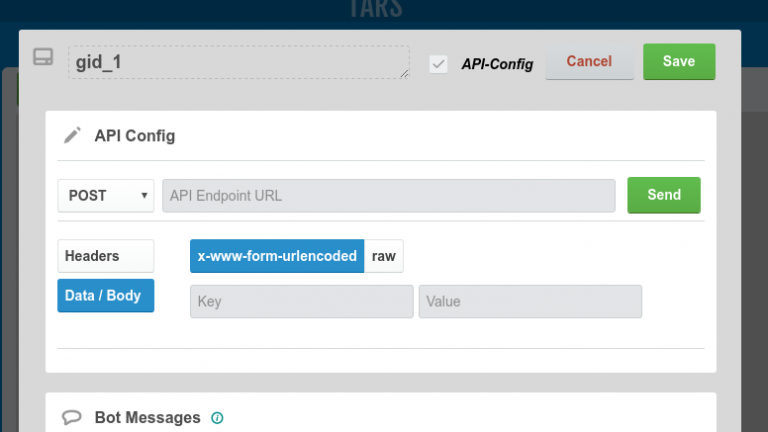 The API Call is configured on a per gambit basis. 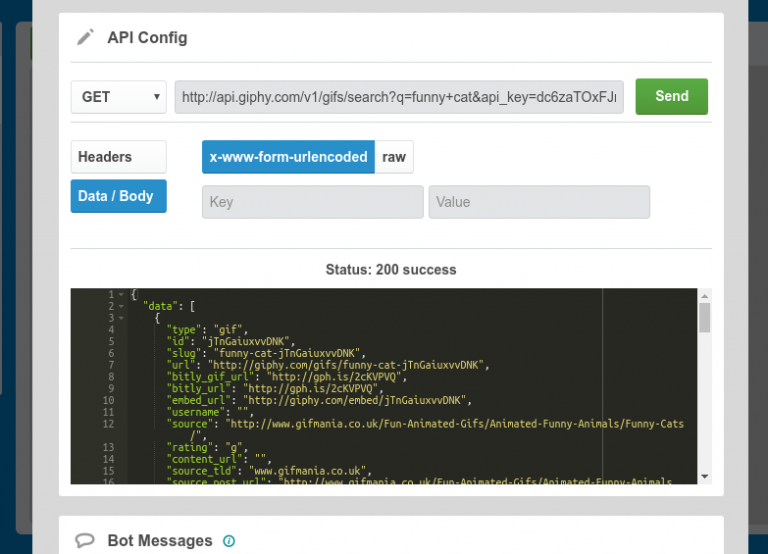 That means you can configure the bot to call an API in one or more gambits throughout the ConvBot. 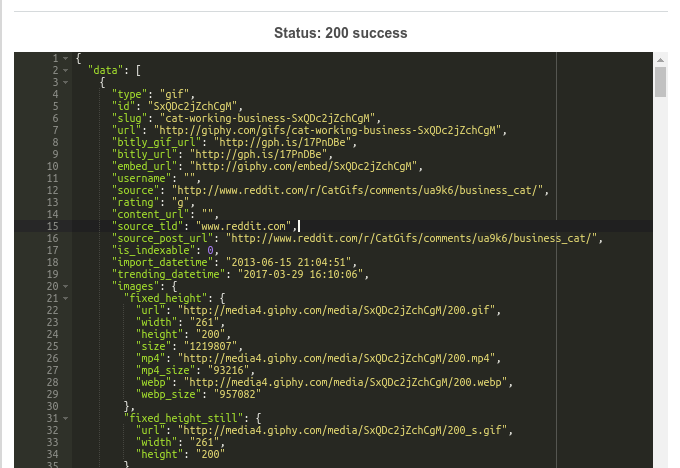 When an API Call is configured for a gambit, it makes an HTTP Request (GET, POST, PUT etc..) just before the bot displays the message bubbles of that gambit to the user. That means if you want to display some dynamic information in the current gambit, you should configure the API either in the current gambit, or any of the previous gambits that the user must have visited earlier in the conversation.